Danielle Hartigan is Mother Superior! When we launched our Kickstarter campaign, we offered up many featured cameos as well as three MAJOR roles in our story to our backers. The One Who Got Away reward was snagged by Dave Rambo, who will appear as ReGen Corp’s Head of IT. Yeshua’s bodyguard Inquisition will be played by backer Steven N. Long. The third role, that of the Antichrist’s unholy abbess Mother Superior, went unclaimed… until now. The Wisdumb team is thrilled to welcome Danielle Hartigan to the cast of Escape From Jesus Island! Our own Mortimer Glum will be transforming Danielle into Yeshua’s moral compass. Look for a redesigned face coming soon to a Mother Superior near you! In flashbacks, we’ll see Danielle pre-transformation as Nurse Hartigan, the pious ReGen Corp worker responsible for putting down the failed test subjects. When we join the story in Episode 1, Nurse Hartigan has already been in Yeshua’s clutches for two years and has undergone a radical metamorphosis. The good Mother will make her first appearance in Episode 4. 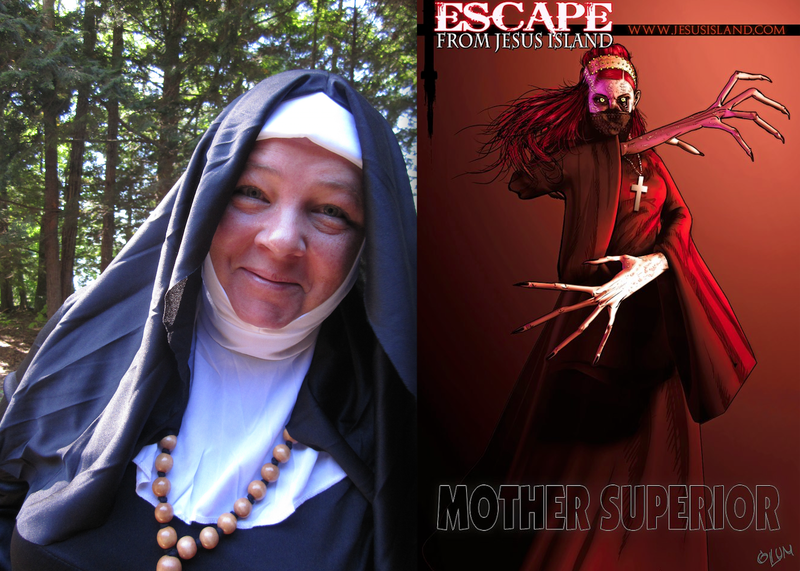 Mother Superior has always been one of my absolute favorite characters in EFJI. When the story has fully played out, I think this will be the one role people will be blown away that we offered up to a fan. Welcome to the horde, Danielle! If you missed out on our Kickstarter and want to be a character in Escape From Jesus Island, we are making the last few unclaimed roles in our story available to fans, starting at $150. Details coming soon! ← Contest: EFJI Scavenger Hunt!